Riding in college was something that I always dreamed of doing. I started riding when I was ten. And now, I’m living my dream of being on an intercollegiate riding team in college. In riding, I think it’s important to remember where you started. You didn’t always know how to jump a course of jumps or pull a mane, etc. Our sport has become one that is a little judgmental unfortunately. If you’re not doing the biggest and highest class, it seems as if you don’t matter. I think this assumption can get the aspiring equestrian down at times. This sport is expensive and time consuming, but the horses and the love of the sport is ultimately what it is all about. We are lucky at St. Andrews to have such wonderful horses that we get to ride so frequently. 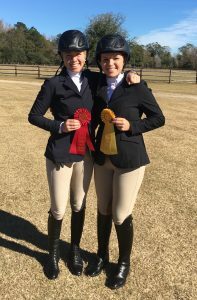 Liz and Zoe at ECU in November! This isn’t a sudden realization, but a slow stumble that I came across after being diagnosed with Femoroacetabular Impingement in both of my hips over Christmas break. Basically, the bones in my hip grind together when I move, walk, or ride which is what has caused the labral tear. The doctor told me that I probably should modify my activity and will eventually need surgery because the labral tear in the right hip will not heal on its own. I was glad to have an explanation for all the pain I had been experiencing. This diagnosis was pretty devastating because of how much I love to ride. To make the pain subside a little, the doctor recommended I reduce my riding to three days a week since I told him surgery was not an option until after graduation. I wanted to be able to ride during my last semester of college. Zoe and Jack during chores after the last hunter seat home show of the year! For someone who usually rides pretty much every day, it came as a set back and it posed challenges that were hard to understand at first because I never had physical challenges with riding. Any challenges I faced were usually mental blocks or required little tweaks to fix a problem. So, to experience something that completely altered the way I rode because of pain changed my perspective on riding all together. I now have a greater appreciation for little milestones because in this journey, I have definitely had to learn to celebrate small achievements. It’s hard to explain the type of pain that I was experiencing. This condition has made regular activities like sitting for long periods of time, working out, and riding horses very painful and hard to do. Two of my favorite things, working out and riding horses were now more difficult and caused so much pain. The doctor even recommended that if I were to have the surgery, I probably wouldn’t ride for at least six months to a year. Thankfully, I found a way to modify my workouts to not cause as much strain on the lower body. I mainly did upper body and abs for the first couple months as I let my lower body adjust to riding again. I learned to listen to what my body was telling me and tried not to push myself too far. If I did happen to push myself too far, I would feel the throbbing pain in my hips when I laid down at night to go to sleep. It is an awful type of pain that I wouldn’t wish for anyone. The type that doesn’t easily go away with over the counter meds or even the anti-inflammatory meds the doctor prescribed me. Plus, those anti-inflammatory meds were only for the “worst” days. But how do you classify pain that never really goes away? Coming back into a regular riding schedule after so much time off over the holidays was a struggle. I had to slowly build up my strength to be able to ride without being in too much pain. It was hard the first couple weeks because the condition or the pain can’t be seen. Even though others’ reactions to this shouldn’t have mattered to me, I wondered what others would think since I rode so much last semester and suddenly this semester I wasn’t riding hardly at all. I had qualified for regionals in IHSA last semester, so I wanted to at least be able to attend my very last regionals of my college career. I was selected to ride for the team at the last home show of the season. I drew Vic, one of my favorites. I even showed on him a couple years ago and received first place for WTC. This time however, it was difficult to control my body and hips since he has so much movement at each gait. I ended up placing last, but for once in my life I was actually proud of the last place finish because of the struggle I had been through during the weeks leading up to it. It was the official end of my regular season collegiate career and I was proud to have been able to experience it with some of the most supportive coaches I could have asked for. After the home show, I drove to Winston-Salem to see a doctor that gave me an injection in the right hip to help ease the pain. Two weeks later, I made it to regionals and had the best ride all semester. The injection didn’t completely eradicate the pain, but it made it less intense which made riding a little more bearable. Even though I didn’t progress onto Zones, I am proud to have pushed through when I thought I should just give up. If I have learned anything at all this semester, this condition taught me to take it one day at a time and to never give up. It’s important to know that even if the original plan can’t happen, modify it to match what can happen. After regionals was over, I reduced my lessons to two days a week. I still enjoy riding, but at this point it was more about having fun than being competitive. Since taking this new approach, I have been able to be more successful in my lessons and actually enjoy them. The pain is still there, and challenges haven’t changed, but only riding twice a week and building strength in other areas of the body has really helped a lot. It’s not so much about the destination anymore instead, it’s about the journey and the progress it takes to get there. Fast forward two and a half months to today, and I had the best lesson I have had all semester. What changed you ask? I have learned to accept what I am capable of doing now rather than constantly comparing to what I could do before the diagnosis. I’ve also gained some confidence back since I have accepted where I am at this moment which makes me a better rider because I am not always second guessing my decisions. At this point, surgery is still on the horizon. I’m not sure when, but I know this needs to get taken care of before it gets significantly worse. I am thankful to be able to finish my last semester of college doing what I love even if it is a lot less than I would have hoped for. In the equestrian world, there are bound to be set backs whether it is an injury to the horse, rider, change in finances, etc. It’s important for riders to understand that there will be set backs. Something always happens that is unexpected or even unwanted, but it makes all the difference when you accept the setback for what it is and then figure out the best steps to move on and recover. 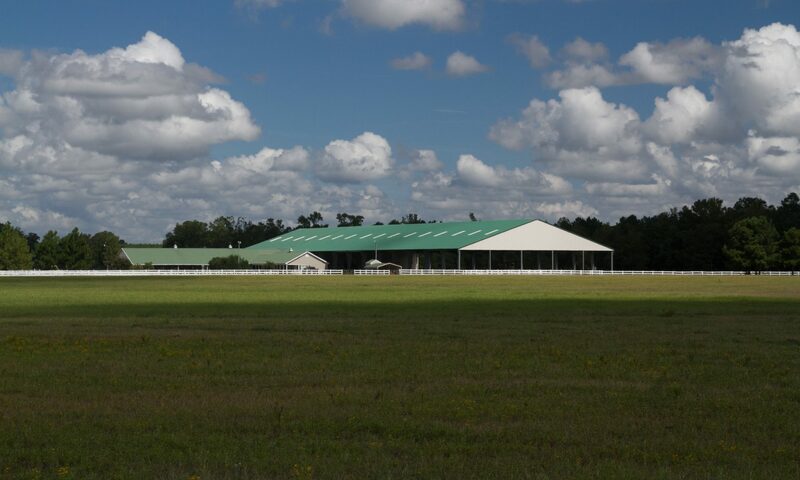 Here at St. Andrews, we compete in the Intercollegiate Horse Show Association (IHSA) and Intercollegiate Dressage Association (IDA). Both of these associations are wonderful because we have the opportunity to ride a horse we have never ridden and compete in horse shows. 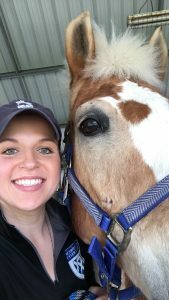 These associations teach riders to be adaptable to whatever horse we may ride. There may be a bad draw but just like any setback, it will only make you stronger in the long run.